S tímto tričkem uděláte největší parádu zejména při vstupu do Egypta nebo jím oslníte imigračního Úředníka po příletu do USA. Ten vám určitě hezký pobyt nepopřeje. 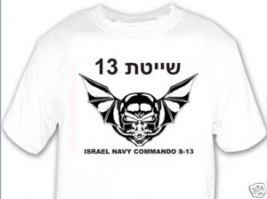 Israel Navy Commando S-13 T-shirt. Shayetet 13 (Hebrew: ×©×™×™×˜×ª 13â€Ž, lit. Flotilla 13) is an elite Israel Defense Forces naval Special forces unit. The unit (S'13) is considered one of the top-three SF units in Israel (along with Sayeret Matkal - the General Staff Reconnaissance Unit - and Shaldag Unit - the Air Force commando unit). S'13 is the unit that specializes in maritime hostage rescue and counter-terrorist missions. Only a handful of Shayetet 13 missions have been publicized or otherwise missions publicly attributed to the unit.